Whether you’re a pro at navigating in the cold or you’re new to driving in winter, our winter driving tips in Denver will help our neighbors escape the experience with their vehicle — and sense of humor — intact. Contact Us What Happens if You Don’t Change Your Oil? Check Your Battery: Have a certified technician check your battery health to make sure it’ll stand up to winter temperature shifts. Inspect Your Lighting: Check all your bulbs, fuses, and connections to make sure you won’t be left in the dark. Have Your Brakes Inspected: If you haven’t had your brakes inspected in a while, you should have a technician ensure your brakes are still in good shape. Driving in our area, and how you drive, can affect your brake life, and it’s best not to take chances on your brakes’ health. Top Off Fluids: Fill your coolant, antifreeze, washer fluid, transmission fluid, and oil to optimum levels. Check Tire Inflation: Cold temps and high-altitude driving can change the pressure in your tires. Make sure they’re properly inflated and rotated before you hit the road. Change Your Wiper Blades: Ensure you can see the road and all the hazards you may encounter. Inspect Before You Drive: Before you head out, give your vehicle a once-over to make sure there’s no leaking fluid and the tailpipes aren’t clogged with ice or snow. Consider Snow Tires: While AWD and 4WD will help you get around Parker, they won’t keep you from sliding like winter tires. Don’t Rush in the Snow: Give yourself extra time to get to your destination safely. Check the Cams: Department of Transportation traffic cams will give you a sneak peek of the road conditions before you leave home. Prepare an Emergency Kit: An auto emergency kit with a blanket, body warmers, food, water, and an extra charger and battery for your phone can help keep you safe in an emergency. Keep the Tank Full: If you get stranded, you’ll need the extra fuel to stay warm until help arrives. Skip Cruise Control: Using cruise control in snow and ice could cause the vehicle to skid out of control. Don’t Stop on Hills: Avoid stopping on hills as this will make it nearly impossible to get going again. 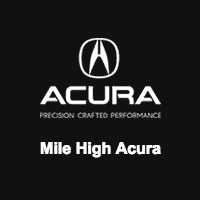 Get More Tips from Mile High Acura! To learn more about winter driving in the Centennial area, or for help prepping your car for the winter ahead, contact us at Mile High Acura. We’ll be glad to help! Once you’re ready to go, check out our recommendations for the best museums to visit to avoid the cold and get more out of winter break.